I want the full nine yards. I Want "The Whole Nine Yards"
The term "the whole nine yards" means there are 9 yards of belted 50 caliber on a front gun on a bomber or the greatest set of aviation instruments loaded with innovation from Insight. So when they say "give me the full 9 yards" Get Insight !!! 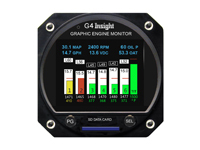 G4 is simply the most advanced engine monitor on the market today, full of new innovation like exhaust valve analysis, vibration, probe diaognosic inflight or on the ground, Air Data Computer with winds aloft and GPS interface just to name a few. With our TAS-1000 you will get Winds Aloft in real-time making fuel management bang on. Another great benefit is knowing the crosswinds on final with our heads up Windicator display. 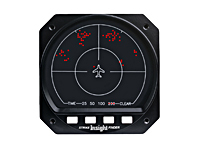 STRIKE FINDER is a time proven lightning detection instrument that has saved pilots time and time again for over 30 years. If panel space is a problem then you might want to consider a G3 2.25" monitor with the same functionality. Running LOP or ROP, then read is this page. Read our new G4 Quick Start Guides. This innovation eventually became the industry standard as all other manufacturers followed suit. Engine monitors depend on numerous temperature probes that have equal potential to inform or confuse when any of them fail. The essential component for your GPS system. Today’s modern avionics integrate many functions with your GPS, but standard installations leave many important features untapped. 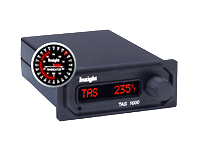 The TAS 1000 Multi-Function Data Source was specifically designed to supply all the information needed to fill in the missing pieces of your GPS or MFD display in real-time. Digital Weather Avoidance System detects and analyzes the electrical activity emanating from thunderstorms within a 200 nautical mile (nm) radius of the aircraft. A unique graphic display plots an accurate, reliable and easily-interpreted picture of electrical activity, that you can use to circumnavigate the hazards associated with thunderstorms. With this line up of great aviation instruments you will be the talk of the tarmac. G4 Graphic Engine Monitor is equipped with all new patented features that will never be found on any other engine monitor. Having Winds Aloft is important in cross country flights for accurate fuel planning along with wind info landing at new runways. Now that you have the engine monitored and know the winds aloft you need to know where the bad weather or thunderstorms are.